Tassels and fringe can add texture and character to your bed, couch or chairs. 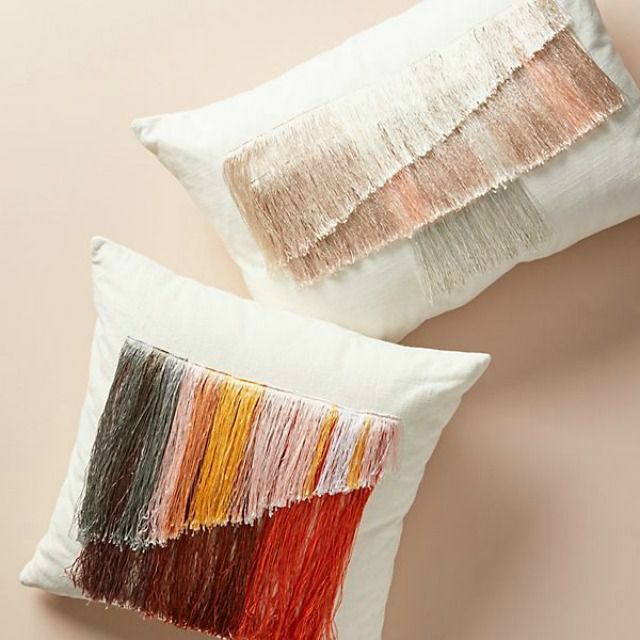 Arkansas-based artist Aly Barohn created these beautiful embroidered fringe pillows for Anthropologie, and we can't get enough of their lush, silky colors. While macrame has a reputation for looking too "crafty" sometimes, this bright white embroidered pillow from Cupcakes & Cashmere's collection for Lulu & Georgia is as sophisticated as they come. Lily Pulitzer's prints are so fun and colorful, this fringe-trimmed pillow would look perfect in a cheerful outdoor space or patio. The velvet trend isn't stoping anytime soon—and this jewel-tone pillow from Target has a funky fringe detail that reminds us of I Dream of Jeannie. Mix, match and go! 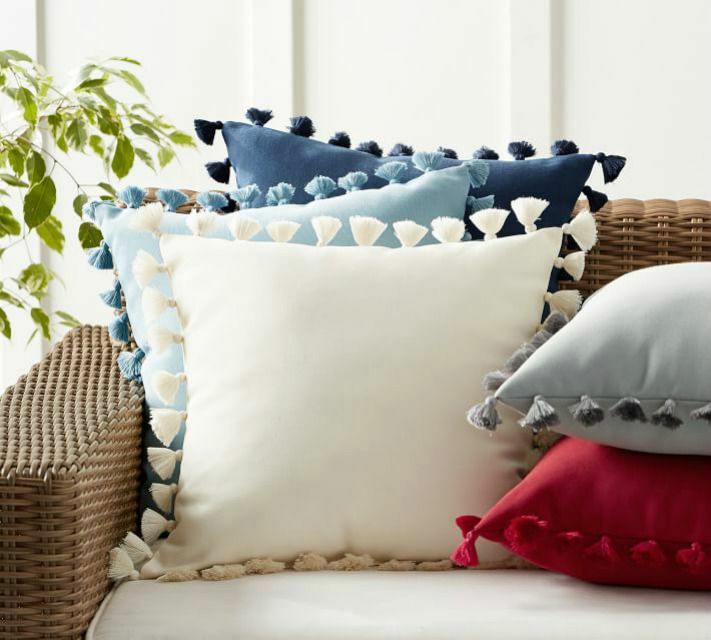 We'd layer up a variety of the colors of these tassel-trim pillows from Pottery Barn that work both indoors and outdoors. We might have an Anthropologie addiction—especially when it comes to pillows. This neutral and natural-looking throw has rows of soft fringe that will add texture to a bohemian design scheme. This printed yellow square pillow gives us major Zooey Deschanel vibes—quirky and cute in the right way. We'd mix this heavily textured throw pillow with other quirky cool prints and colors on a couch or bedroom pillowscape. With thick fringe and rows of popcorn appliqué, this throw adds texture to any room A blend of wool and super-soft baby alpaca wool makes this one feel as heavenly and snuggle-worthy as it looks. Feeling funky? These sky blue faux leather pillow covers will add an on-trend element of Western style to your pillowscape... With a feminine twist. Giddy-up with this genuine cow hair throw pillow fringed with genuine leather. This one would be perfect in your lake house or cabin for thematic vibes... Or tossed in with a collection of eclectic embroidered accessories. These affordable bolster pillows from Urban Outfitters would step up any college freshman's dorm room style game. Mixed textures always get us... And this pillow from Anthropologie is part soft fringe and part waffle knit. A winning combo if you ask us. This crazy-affordable all-fringe pillow cover from H&M brings the drama and the shine. There's something universally appealing about decorating with shades of blue, and this textured and fringed pillow we found from Bloomingdales would work with a variety of design aesthetics from bohemian to beachy. Crafted with a chunky woven fabric and detailed with rows of soft, exaggerated fringe, this pillow from Pier 1 gives will give your chaise or couch a cheery, playful sensibility. Full of all-over texture, this throw pillow from World Market features a white and black woven design accented by salt-and-pepper fringe on the front and around the square edges. Place it on your favorite chair or layered up on the bed to add a touch of global-inspired style. Crochet doesn't have to be restricted to "Grandma" territory. These colorful throw pillows are perfect for a youthful, lived-in living room. We've got the blues—in the best way. The mixed feel of embroidery and fringe on this lumbar pillow from Target make it a great addition to any eclectic space. Classic and versatile, these stone washed fringe pillows from Grandin Road will work in any space, and come in lovely, muted tones that won't grab too much attention (allowing more prominent pieces in your room to shine).